O'Neill arrives at home to find ex-Vice President Kinsey in his living room. Kinsey has been approached by members of the Trust and he insists that the fate of the planet depends upon O'Neill's cooperation to take down the clandestine organization. Kinsey wears a wire and meets with the Trust, who want him to arrange a meeting with Russian Defense Minister General Kiselev, but the surveillance signal is jammed, and when SG-1 moves in, Kinsey and the Trust have vanished. Knowing that the Trust possesses a cloaked alkesh, O'Neill orders the launch of Prometheus and sends Daniel to Moscow to coordinate with the Russians. In Moscow, Daniel attempts to meet with General Kiselev, but he is detained by the Russian military and held for questioning. 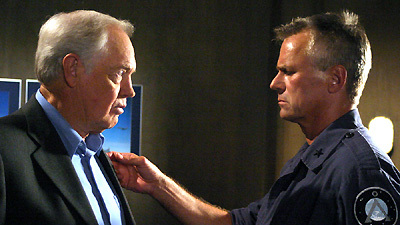 He is informed that Kinsey has been arrested for an assassination attempt on Kiselev, and that Kinsey is now a Goa'uld. Meanwhile, as the Russians go on heightened alert, the US goes to DEFCON 3, and Colonel Chekov arrives at the SGC to coordinate with O'Neill. Carter theorizes that the Trust has been implanted with Goa'uld symbiotes and is intent on infiltrating government and military leaders. Both the Russians and the Americans believe the other has been compromised, and the nations go to DEFCON 2. Daniel meets with Kinsey, and they are transported aboard the Prometheus, but Kinsey escapes from custody and rings himself aboard the cloaked alkesh. There he acquires a wrist device and vanishes before the Prometheus fires and destroys the ship. Meanwhile, as the nations reach DEFCON 1, O'Neill and Chekov attempt to convince the Russian president that Kiselev has been compromised by the Goa'uld who intend to instigate a global war and gain control of the Ancient weapon in Antarctica. Kiselev prepares to launch missiles, and the world waits on the brink of war. Then the SGC receives word. The Russians are standing down. Vice President Kinsey was forced to resign in disgrace. According to Tok池a intelligence, the Trust launched at least two poison attacks against Goa置ld-occupied worlds after the SGC took back the gate. To do so, they had to leave the relatively safe confines of the solar system and head out into the galaxy where they ran the risk of being killed or captured. General Miroslav Kiselev, the Russian Defense Minister, exercises operational authority over all of Russia痴 armed forces, including their nuclear arsenal. He graduated with a Gold Medal from Malinovskiy Tank Academy, received the Hero of Russia for his distinguished leadership in Chechnya, commanded the Carpathian Military District Iron Division, then the 14th Army in the Transcaucasus Military District, and was head of the General Staff Academy for five years before being appointed to his present position. He also suffered from glaucoma and had extremely poor vision until the condition was corrected by a symbiote. Colonel Ruslan Chernovshev was General Kiselev痴 chief of staff. Three years ago, he was involved in a plot to sell a captured symbiote to elements of the Trust then operating within the NID. President Mikhailov is the president of Russia and acting commander-in-chief of the Russian armed forces. He has spoken with O誰eill in the past. The United States reaches DEFCON 1. Symbiotes can cure the host body of any number of physical shortcomings, including bad eyesight and glaucoma. Daniel has a conversational fluency in Russian, although Captain Voronkova feels English would be preferable. O誰eill is partial to Heineken beer.